Bruins defenseman Johnny Boychuk has been taken to Montreal General Hospital after suffering an injury from a scary collision along the end boards in Thursday’s game against the Canadiens. Boychuk was hit by Canadiens winger Max Pacioretty and immediately laid on the ice on his hands and knees. 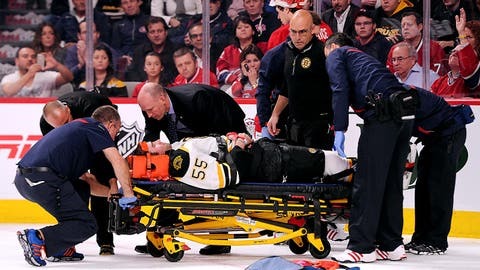 With the help of teammates Zdeno Chara, Milan Lucic and medical staff, Boychuk was escorted off the ice on a stretcher. According to Bruins general manager Peter Chiarelli, Boychuk had movement in all of his extremities before leaving the Bell Centre and is at the hospital for observation.